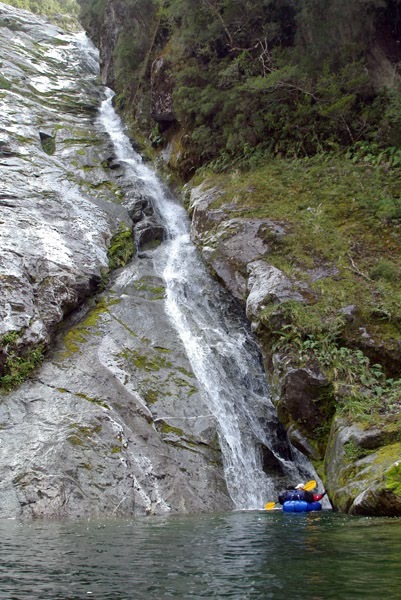 Valle de los Exploradores, valley of the explorers - an enticing name for any adventure seeker. One look at the dramatic green-carpeted mountains, topped with jagged granite and hints of white peeking out from the vast millions year-old ice field they host and we knew it was going to be a big one. 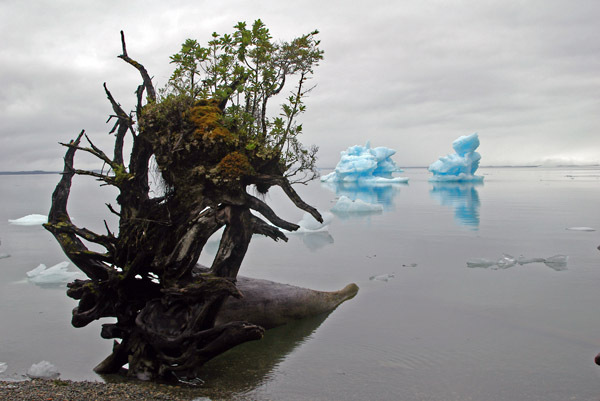 On February 28, 2008 Antofaya Expeditions launched Expedition Explorers, a two-person, unsupported, month-long exploration of rivers, fjords and glaciers of the Northern Patagonian Ice Field in southern Chile. 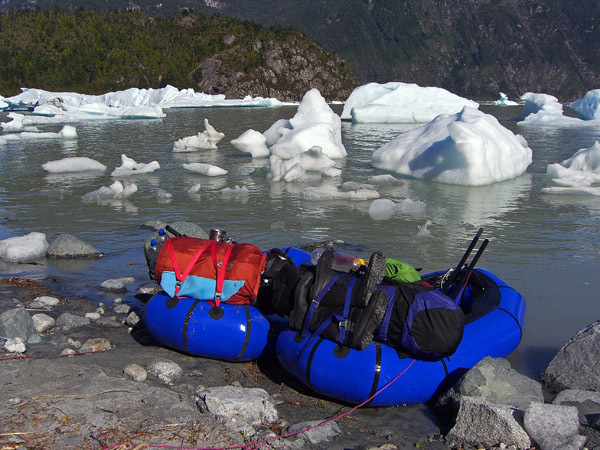 In 34 days we covered around 300km on foot and using inflatable packrafts to navigate the icy rivers and deep fjords. 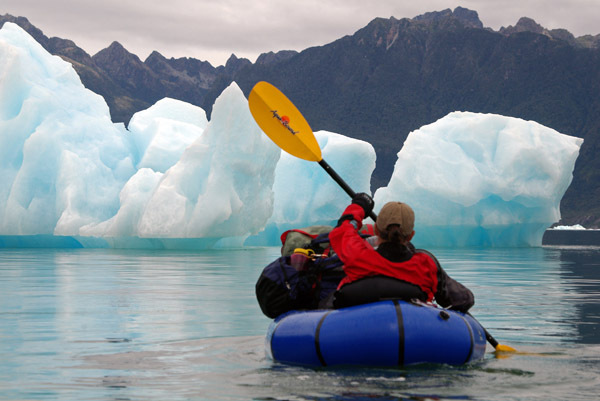 We paddled up to three glaciers for a close-up look at the glacial retreat in Patagonia. We learned to paddle on fast-moving rivers and through waves and wind. We slept in the forest and on the beach. We greeted animals that had never been hunted and were unafraid to approach us with all of the curiosity and wonder that we had for them. 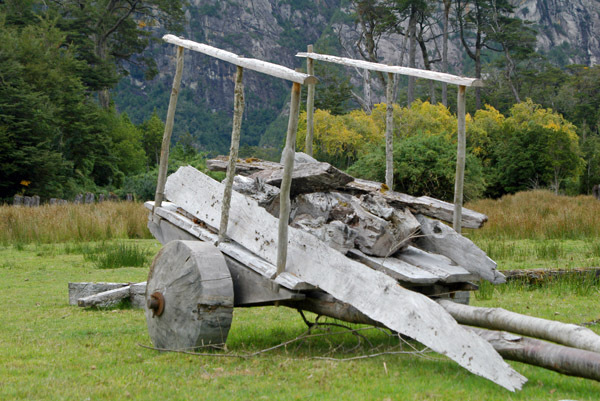 We followed in the footsteps of ancients and early settlers and pioneered a new route of our own. We took time to reflect on those early explorers who faced the extreme environments of this region without the technologies and equipment that helped us on our journey. 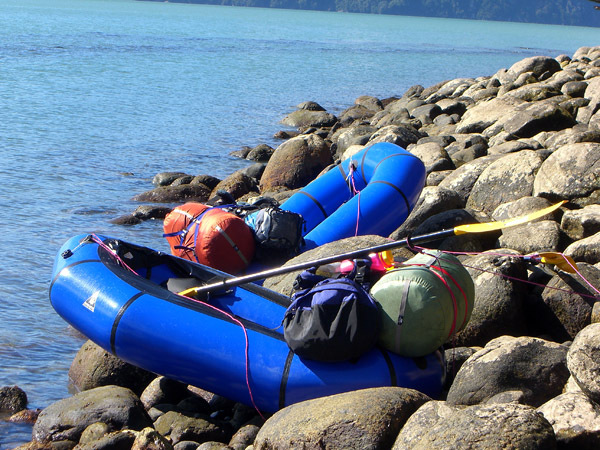 For us, the inflatable packrafts we used to travel down the rivers and fjords gave us a flexibility that would not have been possible with any other craft and allowed us to explore places that may never have been tread upon. We also relied heavily on satellite maps and images to plan our route and GPS to stick to it. We avoided hypothermia with our drysuits and neoprene gloves and complimented our fresh caught fish with dehydrated gourmet like Turkey Tetrazzini. 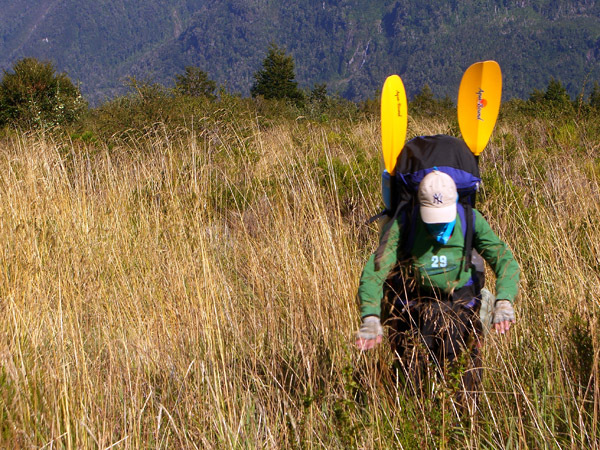 For adventurers, Patagonia is a magic land of beauty and rugged challenge. 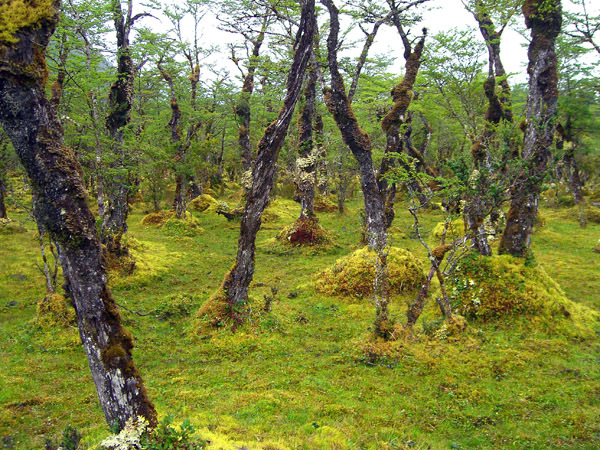 It is the last frontier, one of the wildest, most unexplored places left on earth. 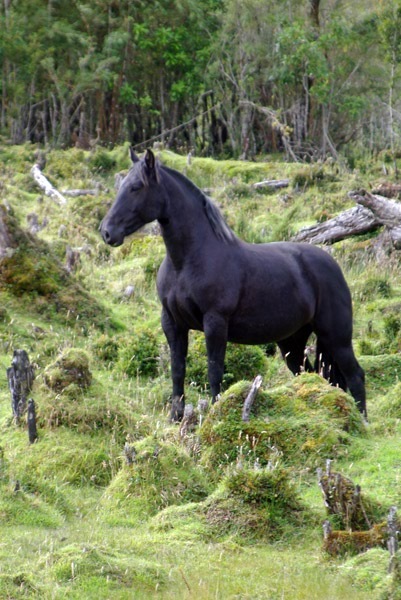 And yet, the land has a history that man has been a part of for centuries and for those men and women who have eked out an existence in these wild lands, Antofaya now has a deep admiration. We can't wait to come back! 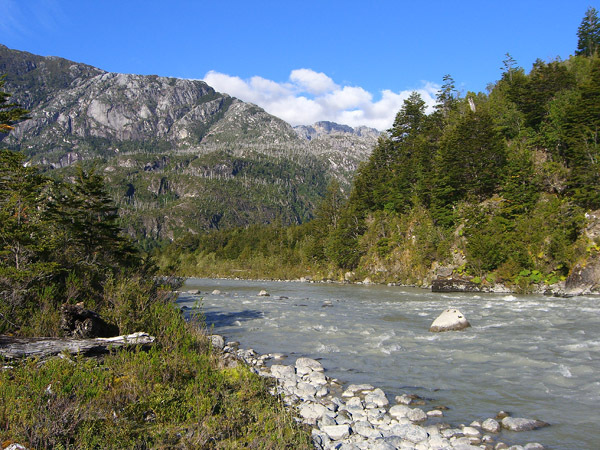 Our journey began with our first paddle down the Rio Exploradores, an enticing milky gray glaciar river that flows through a verdant green valley intermingled with rugged granite peaks and topped off with a enormous field of millions of years-old ice. We floated down this icy river amidst the beautiful scenery one can only find in Patagonia, scenery that makes you laugh because it is too pretty to be believable. 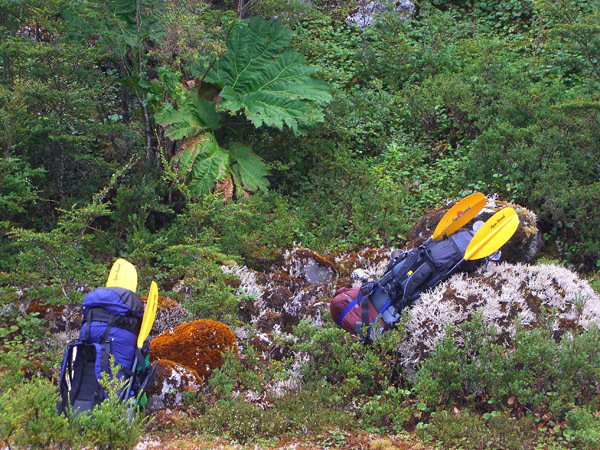 We began our adventures heavy with anticipation … and gear! 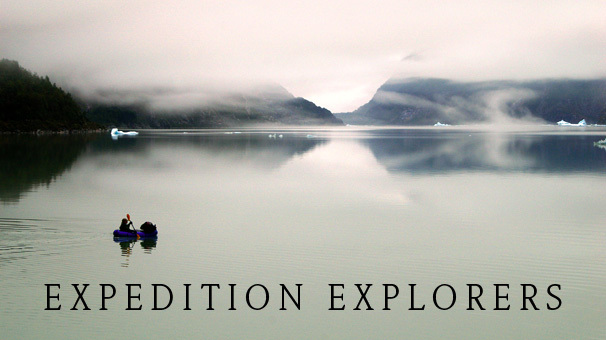 Paddling in a huge, open fjord in a small inflatable boat can be a very humbling experience. We learned quickly that we must pay close attention to the tides and that the weather and wind would be dictating when and what we could do in a day. 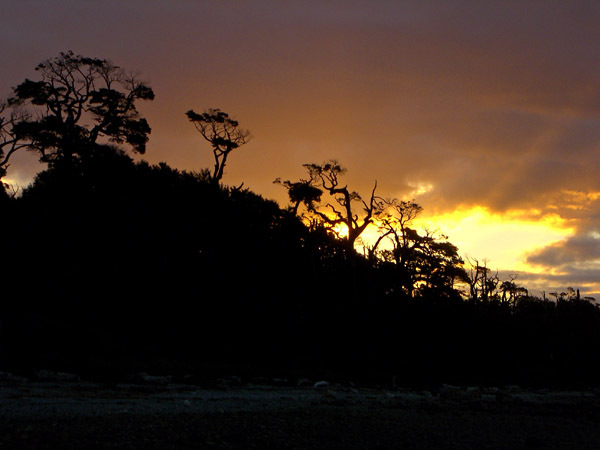 Some nights we camped in a thick forest, others on stony and sandy beaches. Many evenings we had the magnificent treat of watching curious dolphins jumping and playing near the shore at sunset. At lunchtime we often heard sea lions throwing their fish lunches around...one even trailed us in our boats for a while until it figured out that we weren't really that interesting after all. The name of this body of water is a little deceptive—this "river" isn't really a river at all, just a narrow extension of the Elephant fjord that empties out into the wide mouth of the "Laguna" San Rafael, which is also part of the Fjord. 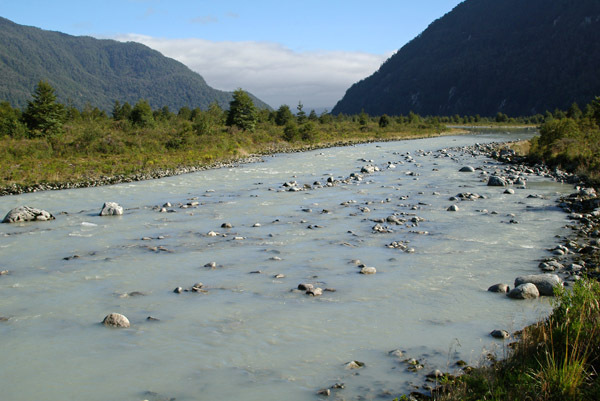 But the Rio Tempanos sure flows like a river, if you can think of any other river that flows in two directions. The Rio Tempanos is affected by the tide and travels both north and south—very handy if you plan on entering and exiting the Laguna on the same river! Paddling on this fast-flowing body of water, we covered nearly twice the distance we had been paddling on the open fjord. 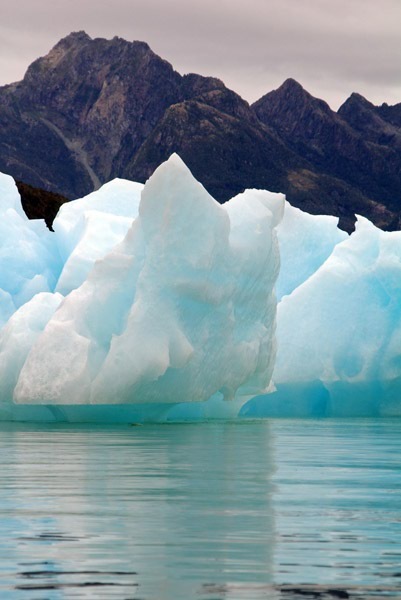 The other part of its name is definitely appropriate … this river is full of beautiful icebergs and huge chunks of floating ice on their way to the sea after having fallen from glacier San Rafael. 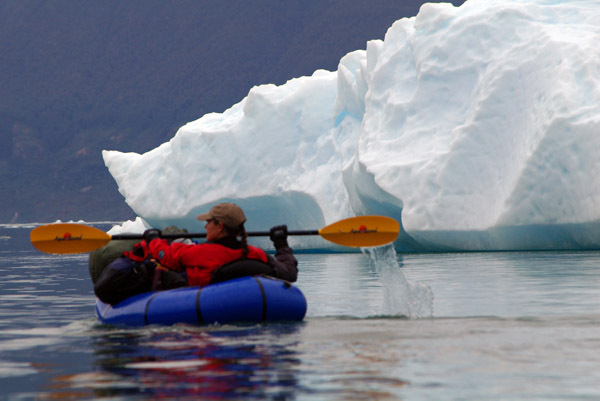 Navigating a maze of floating ice while you are traveling some 15 km/h in an inflatable boat can be tricky though. 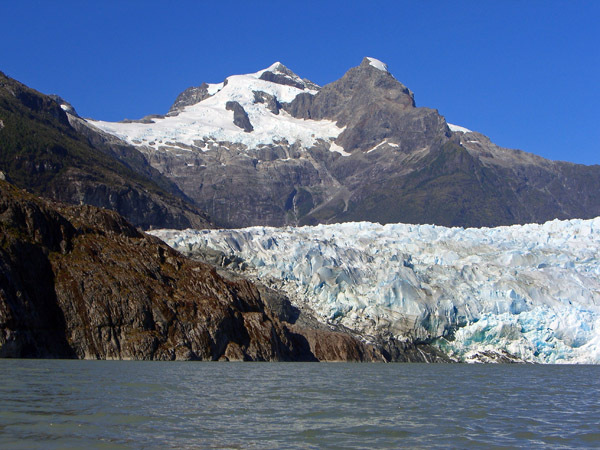 Glacier San Rafael is the most well known of the Northern Patagonian Ice Field's 28 exit glaciers. 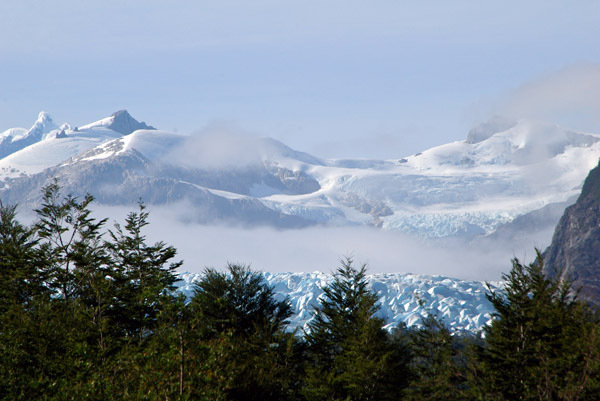 The area surrounding the glacier has been made into a national park and UNESCO Biosphere Reserve for its diversity of flora and fauna not found elsewhere in the world. 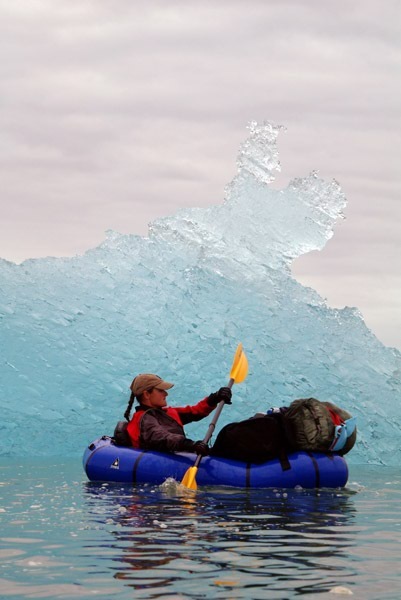 It is a stunning glacier that is constantly shedding huge walls of ice that plunge into the waters below from hundreds of feet up, creating big tidal waves that rock the huge sculptured icebergs floating in the lake … as well as small packrafters. We paddled around the laguna, camped on its shores and took in the blue and white wonder that is glacier San Rafael for a couple of days. 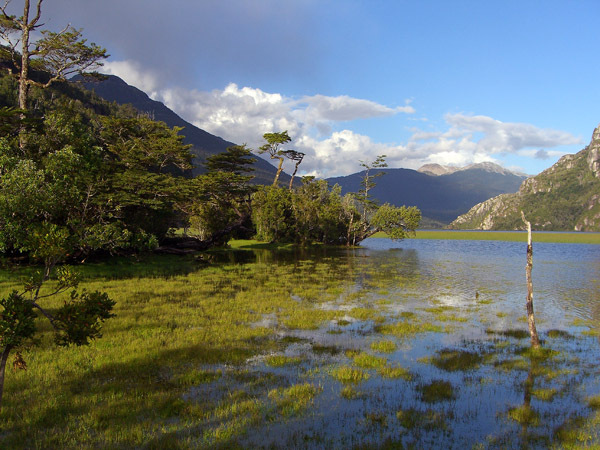 Geologically and historically, the Ofqui Isthmus is a very important place. The South America, Nazca, and Antarctic plates join at Liquiñe-Ofqui fault line, which has it southern terminus on Ofqui Isthmus. 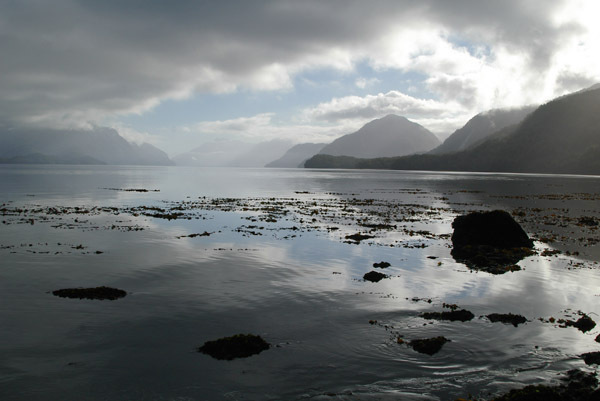 Natives and missionaries used to carry their boats from the Gulf of Penas to the Moraleda Channel across the Ofqui Isthmus in order to reach the Taitao Peninsula. 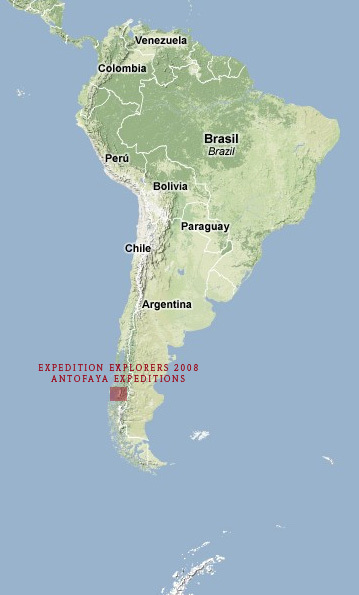 The isthmus marks both the end of San Rafael National Park and the southernmost point of Expedition Explorers 2008. 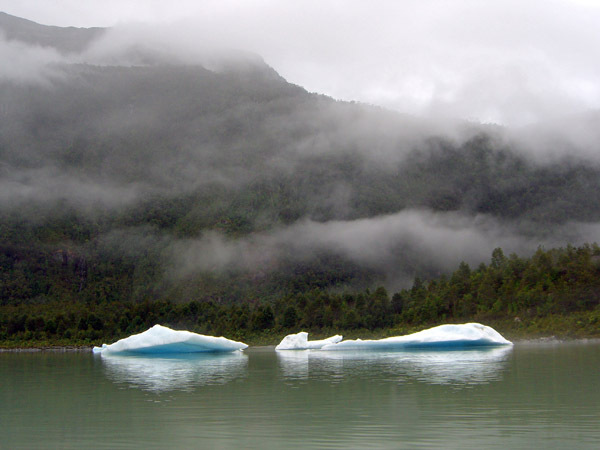 We weathered an impressive storm on the Isthmus that sent ocean-like waves and large icebergs crashing against the shores of what was hours before a glass-like lake. We spent a late night and early morning standing guard in front of our tent while the waves began to lick the edges of our tent, betting on whether the tide would be going out soon or if we would have to relocate the tent to the forest. The tide did go out and we eventually slept for a couple of hours before waking to the incredible sight that had been invisible to us in the dark night. Every chunk of ice floating in the lake was now pushed up on the shores where we were camped. It was an incredible sight and we heated up some of the smaller blocks of ancient ice for our morning tea while we contemplated our exit strategy. After departing the Laguna San Rafael via the Iceberg River (working the tide in the opposite direction this time), we planned to head back north along a very different route than the one we had come south on. 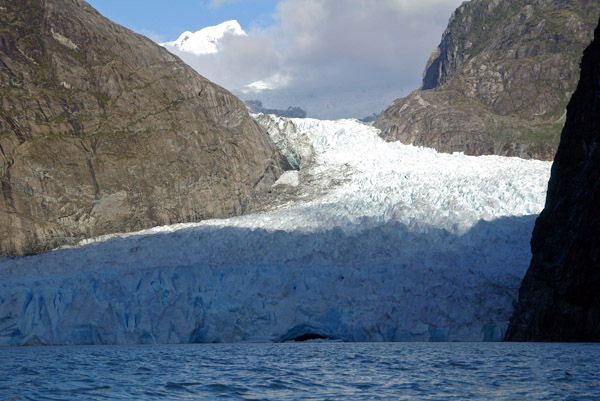 The first stop on this route was a visit to Glacier Gualas, a smaller, but still impressive receding glacier. Here we had one of our coldest nights and most beautiful camping spots surrounded by mountains. Though every day of our adventure was unforgettable the highlight of our trip was a day of uncertainty topped off with success and tranquility and a visit to Glacier Reicher. 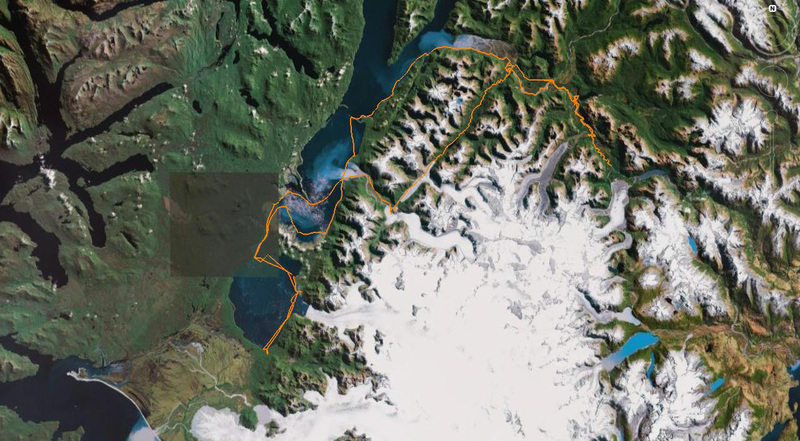 On the satellite maps we were using, which were images taken about five years prior to our trip, Glacier Reicher stretched across a narrow valley forming a white wall of ice blocking access to the Rio Sur, which eventually connected with the Rio Exploradores, and our base camp. 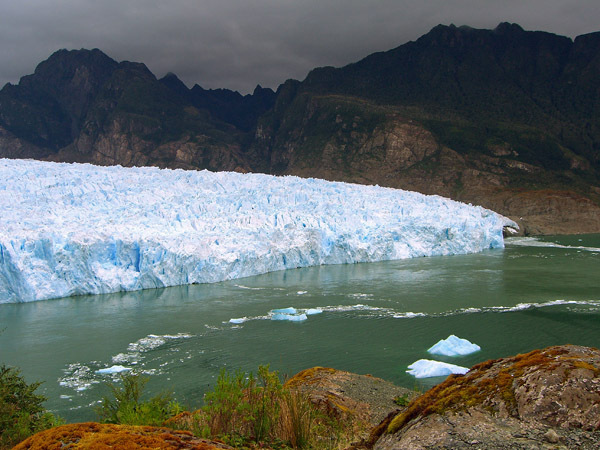 Given what we had read about the alarming rate of retraction the glaciers in this region were experiencing, we took the chance that there would now be a channel in this wall of ice through which we might safely pass to reach the Rio Sur. Much to our amazement—and a complicated mix of other emotions including fear and sadness for the planet, relief and joy for our legs, arms, and backs—the glacier had retreated all the way to the other side of the valley. 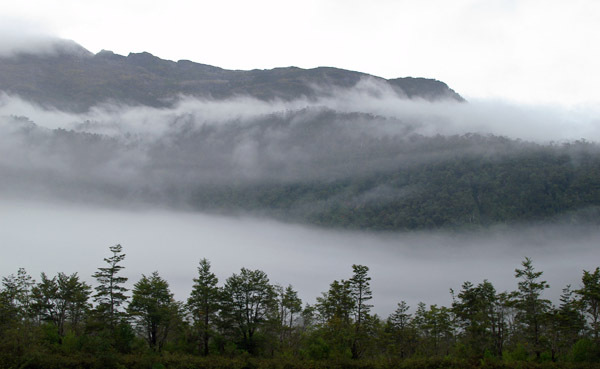 What was once an impossible journey to cross a bridge of ice between sheer granite cliffs was the most peaceful and meaningful float of our lives in a quiet green lake draped in mist. 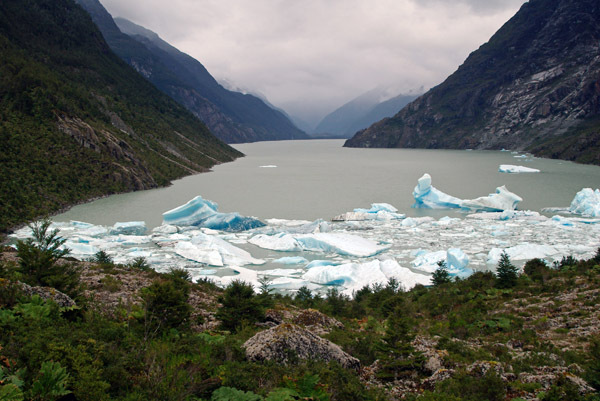 Reicher is still a stunning glacier, which swoops like a giant white slide down a vertical drop with a graceful curve. Though all of the places and creatures we saw on our trip left a huge impression on us, I think Reicher gave us the most to think about. 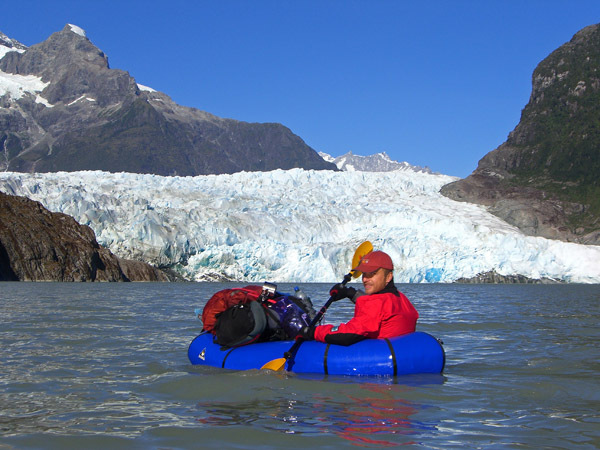 The glacier's demise and our portable boats allowed us to pioneer a route that we believe has never been achieved before. Likely the changing climate and geology of the region will open up many new routes and avenues for tourism in this region, which will surely change the character of this wild place. We felt very lucky indeed to experience it in the way we did—as a reward to a physical and mental puzzle that we solved not on our own but by learning to work with the natural forces around us. 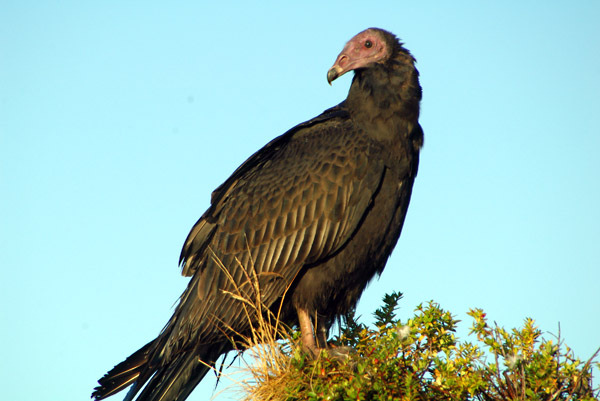 The Rio Sur is a creature with many faces—one moment deep, green and slow with a soundtrack of noisy parrots and the smell of moist earth, and the next a crashing violent cauldron of churning whitewater and enormous boulders. 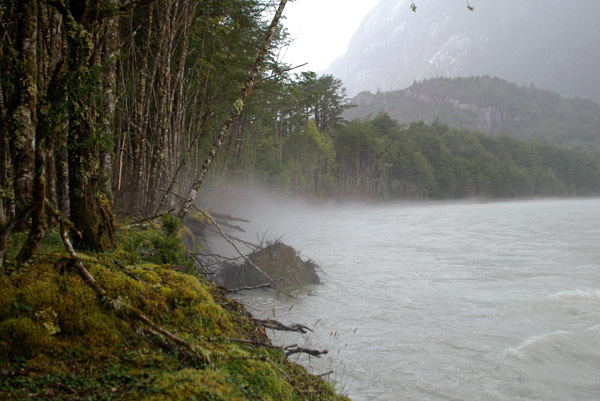 After a few moments of feeling like accomplished adventurers from our trip to Glacier Reicher, the Rio Sur reminded us once again that we are not less forgettable in a wild land than a spider is in our house. 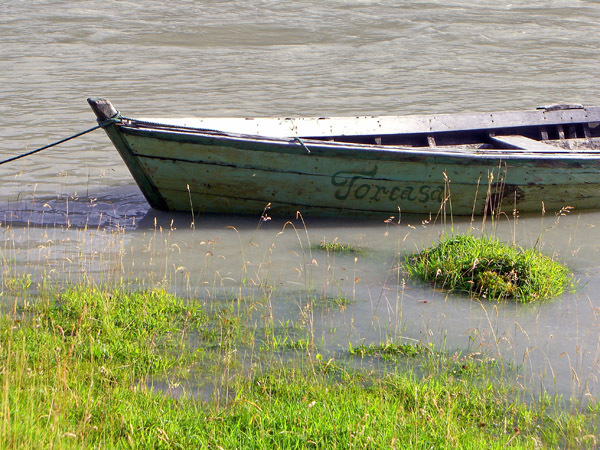 We made it down the length of the river, but with our tails tucked firmly between our legs as we praised the incredible strength and construction of our boats. 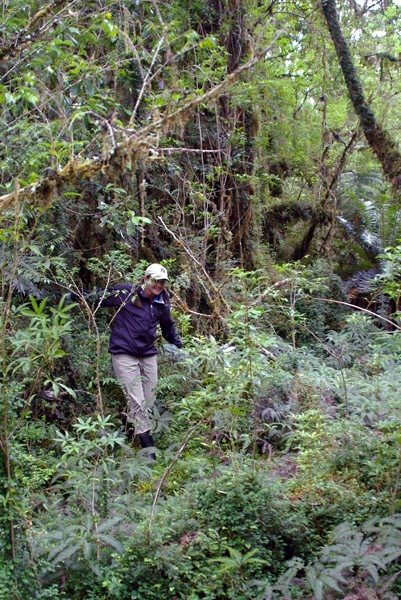 The last leg of our journey was three days of hiking back along the shores of the Rio Exploradores using a muddy footpath that branched off in a confusing network of animal trails at any given moment. 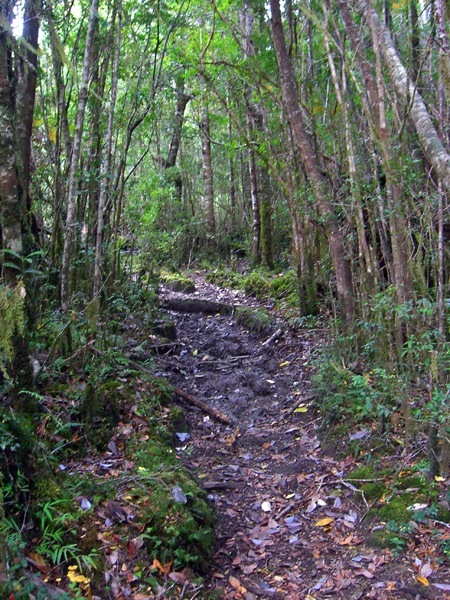 This trail connects the few families or solitary people living a very hard and isolated life along the river. We met a couple of these folks on the trail and they seemed to know who we were—ah you are THOSE crazy gringos! I guess that communication is not as primitive as it might seem amongst these massive tracts of land. We were incredibly impressed by both the primitiveness and efficiency of the settler's lifestyle. These men and women are completely self-sustaining, relying on the outside world only for minimal supplies and medical emergencies. It was like getting to walk through a live re-enactment of the Wild West in the North America. 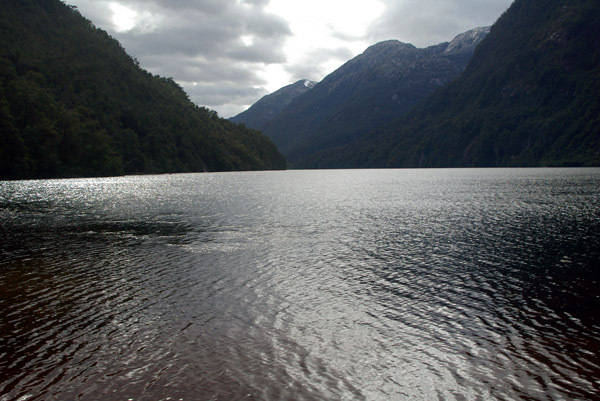 One sailing boat with German and Chilean crew visiting Laguna San Rafael, four settlers living on the banks of the Rio Exploradores, salmon fisherman working at remote fisheries in the Elephant fjord. • Nalca: we used the gigantic leaves of this jungle plant as umbrellas while cooking in the rain, extra coverage to keep our gear from getting soaked through during rainy nights, and also as plates, and clean surface for cleaning fish on sandy beaches … very useful plant. Apparently you can also eat the stalk of this plant. 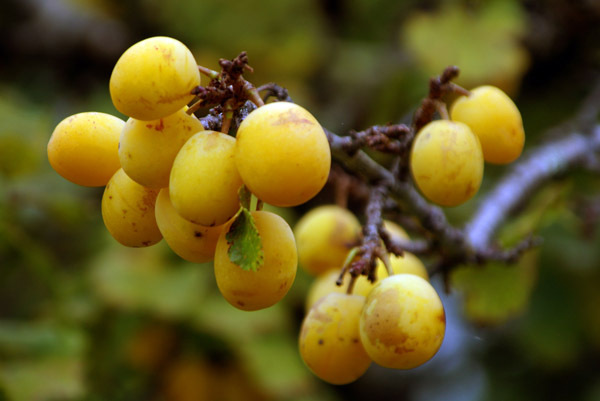 • Murtilla: We ate handfuls, and sometimes Nalgene bottles-full of this tasty and sweet berry that locals use to make preserves. A small handful makes a lunch of protein shake much tastier and they are delicious drizzled with honey. 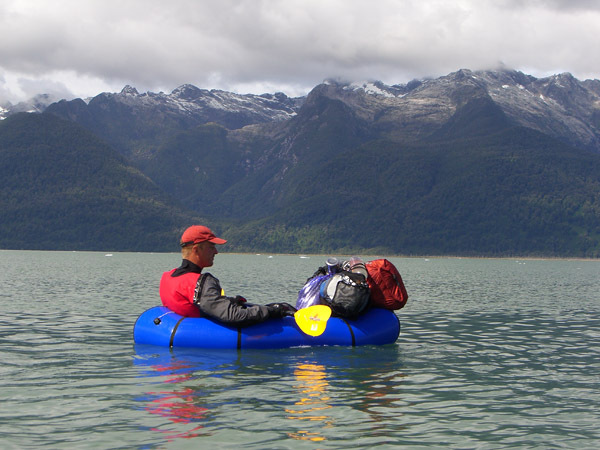 Thanks to an idea planted by reading the trip notes from www.groundtruthtrekking.com, an account of a packrafting trip from Seattle to the Aleutian islands, we were able to get double use out of our ultra light self-inflating sleeping mats as personal flotation devices. We quite simply partially inflated them and wrapped them around our middle inside the dry suits. They were quite comfortable and offered great buoyancy in the water, though we only got to enjoy their usefulness during gear tests, since we never went swimming by accident during our adventures. 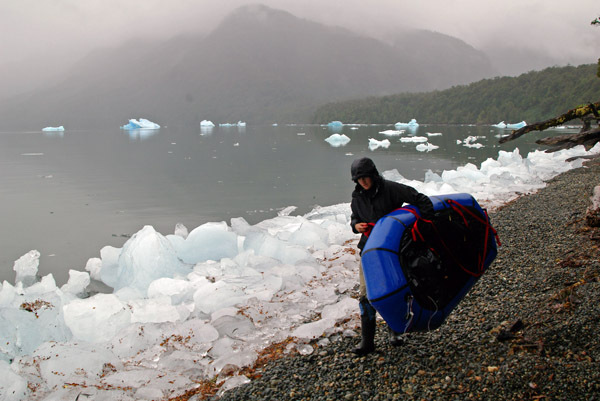 We used thin foam mats lined with the same material since in silver emergency blankets that we bought for less than $5 in Sodimac, the Chilean equivalent of Home Depot to line the bottom of our boats for insulation from the chilly glacial waters below. We had one pair of 2m (6ft) loading straps and one pair of 4m (14ft) straps for strapping our backpacks and drybags to the fronts of our boats. By far the more useful were the longer straps, which offered more flexibility. We also made a tether for each boat which connected both the paddler and the oar to the boat at all times. These lines were also used for tying up the boats at our campsites during the night in case of winds, rains, flooding at the beach sites, etc. Our team leader made very simple throwbags using floating nylon line and mesh ditty bags. These were tied to the boats and kept on hand at all times inside the boat in case one paddler needed to help the other. We used Kokotat semi-dry suits bought on sale at REI. They are full body suits, including feet, made of breathable material with rubber gasket wrists and neoprene neck. The suits were very comfortable and relatively easy to get on and off. We took great care with the zippers on the sandy beaches we camped on and they seemed to work fine throughout our trip, though a little stickier, as was everything, while we were paddling on the sea. One suit seemed to allow some saturation and the inside of the suit became a bit brownish in areas after the first week, but the other suit did not have this problem. We wore midweight long underwear top and bottom underneath, with warm, wool-based socks inside the suit and a pair of old socks outside the suit to protect the material on the feet of the suit, which is not reinforced. We started out wearing strap-on sandals and eventually paddled most of the time with our cheap rubber boots on because they offered a bit more insulation and it was easier to walk in them over shallow sections or places where we need to make a short portage. Because the zippers on the suits are so thick and strong, I was worried about abrasion from the rear zipper on the women’s suit against the inside of my boat, so I wore a pair of long men’s swimming trunks over my suit. 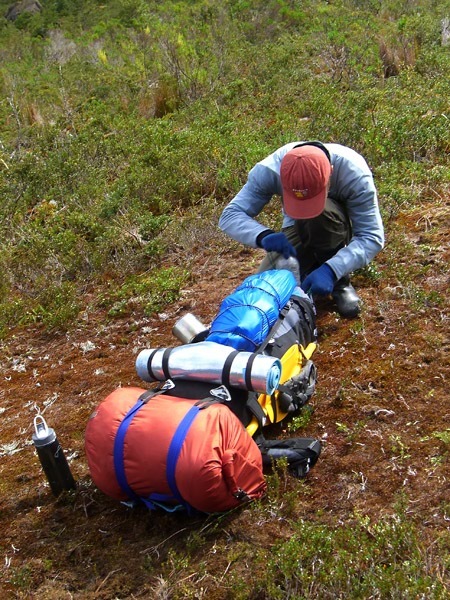 They were cheap, very lightweight, fast-drying material and also offered some protection from spiky plants for the suit while bushwacking on river banks. In Patagonia you will notice that all the locals wear the same thing on their feet—very simple black rubber boots. 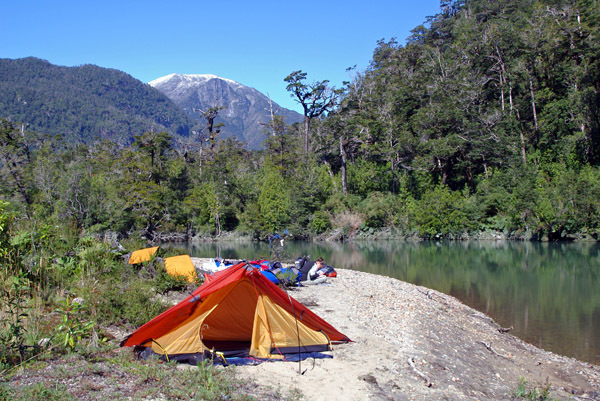 If you plan to do much trekking in Southern Chilean Patagonia, you should buy some of these, they will not be expensive and will be much more useful than Goretex because it rains so much here and most trails are muddy. 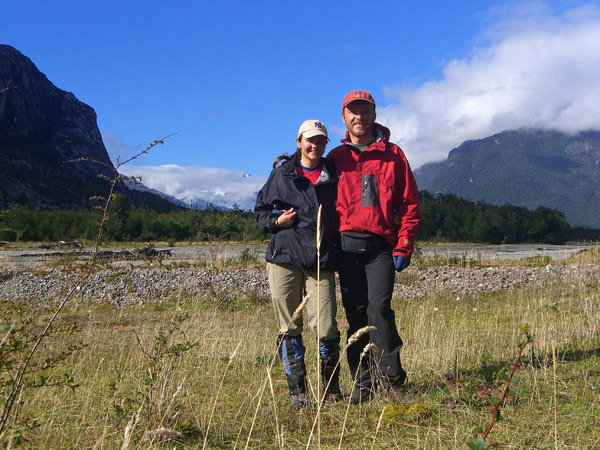 Because our route included so many small stream crossings and marshes, we wore our cheap rubber boots more than our proper hiking boots, though they offer little padding or ankle support. If you can find rubber boots with a stronger sole and good fit for ankle support, this would be the ideal shoe for hiking here. We brought with us two very simple, screw-on-type propane butane camp stoves, one bought in Chile and one in the US as backup. We never used the backup and only used the Chilean stove when we couldn’t make a fire. Propane canisters are not hard to find in Chile either in Santiago or in towns near tourist trekking destinations such as Punta Arenas or Puerto Natales. There is only one company who seems to make outdoor gear here, it is Doite and this will be the brand of gas you will find. Cooking on the fire however was much nicer, warmer, and more practical. We carried all the food for the trip and started with about 20kg (44lb) of food each in our bags. While this seems and felt like a lot, the food we brought was not nearly enough and we both lost weight by the end of the trip because we were not consuming enough calories for the work our bodies were doing. 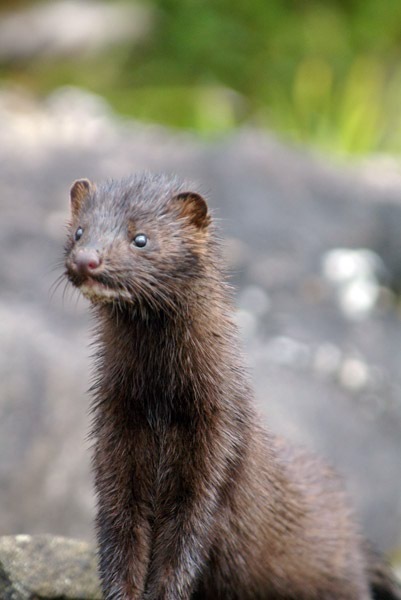 Essential to our food rations were the daily sticks of beef jerky and sausages that offered the little protein we consumed on days we were not able to fish. Nuts and dried fruit were also essential and we added these to our morning oatmeal. Our team leader had a box of protein supplements designed for body building and these became one of our most precious commodities and really boosted our energy levels for the day. We brought some dehydrated food from the US for the last days of our trip, when we knew we would be doing most of our hiking and hoped to have lighter bags and also imported some protein bars, which saved our paddling days. 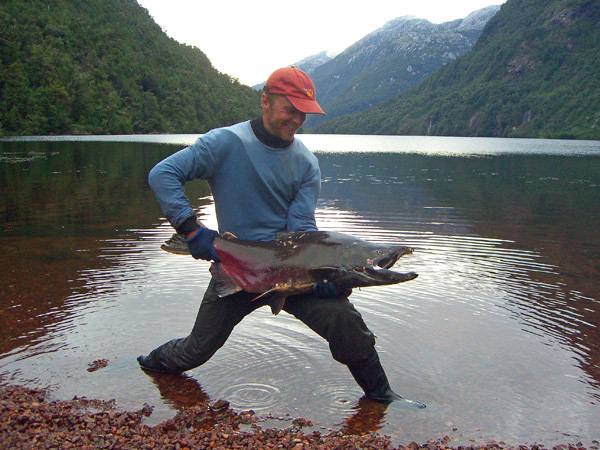 With a simple device of local design (a small, hand-sized cylinder of PVC pipe with a piece of wood for hand turning, a line and simple lure) we were able to catch lots of fish, including enormous salmon, tasty trout, and a fish called roballo in Spanish, which has tender white meat. If we did not have fish, our dinners were typically rice, soup, quinoa, coucous or pasta. For the most part, water here is ten times cleaner than treated water in any given city. After all it is coming straight from million-year-old glaciers. We used a water filtration system only a few times in rivers near small settlements, murky rivers, or where we saw animals grazing nearby. Otherwise we took our water directly from springs, waterfalls, or melted chunks of ice in our cooking pans. The great thing is that it is not necessary to carry much water in this region since it is all around you. 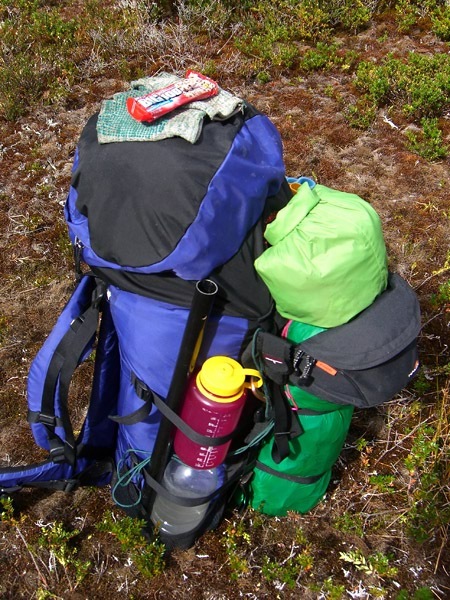 A big help when you are carrying a month's worth of supplies on your back. Our team leader created a set of maps by overlaying a grid, our planned route, and points of interest with printed satellite maps and used the maps in conjunction with a GPS device. Each of us carried an emergency kit in a hip (banana) pack at all times in case of being separated from the rest of our gear and boats. Inside the hip pack we packed a small dry bag with matches, a lighter, small waterproof firestarter sticks (bought in the US), small wrist-watch GPS device, compass, knife, headlamp, identification, a few bills of local cash. We also carried a fully-equipped wilderness first aid kit and a SPOT emergency locator device since many of the areas we planned to travel to are unpopulated. With this device we were able to transmit OK messages to our family and friends’ email and SMS with our GPS coordinates. More photos from Expedition Explorers 2008 can be found on Jaroslaw's "What's Cooking?" web gallery at digitalitis.com.